STANDISH – Schoolhouse Arts Center’s Teen Summer Shakespeare Workshop students will present “A Midsummer Night’s Dream” Aug. 17-19. A Midsummer Night’s Dream is a play by William Shakespeare, believed to have been written between 1590 and 1596. It portrays the events surrounding the marriage of the Duke of Athens, Theseus, and the Queen of the Amazons, Hippolyta. These include the adventures of four young Athenian lovers and a group of six amateur actors, who are controlled and manipulated by the fairies that inhabit the forest in which most of the play is set. The play is one of Shakespeare’s most popular works for the stage and is widely performed across the world. Nineteen teenagers from five southern Maine communities and one from New York have been working with Director Eileen Avery for eight weeks this summer at Schoolhouse Arts Center to perform this Shakespearean classic. Cast members include Jacob Clowes, Esther Eaton, William Emerson, Joe Lambert, Samantha Langevin, Gabrielle Libby, Kristin Nelson, and Stophie Sturdee from Gorham, Devin Adams from Limerick, Ben Plummer, Nate Plummer, and Sandy Rush from Limington, Jamie Eckstein, John Eckstein, Meira Eckstein, and Angelica Phipps from Standish, Kyah Morrissette and Johanna Stanley from Windham, and Katherine Corini from Clifton Park, New York. Performances will be held on Friday, Aug. 17, at 7:30 p.m., Saturday, Aug. 18 at 7:30 p.m., and Sunday, Aug. 19, at 2 p.m. Tickets are $10 for adults and $8 for students and seniors. Schoolhouse Arts Center is located at 16 Richville Road (Route 114) in Standish, just north of the intersection of Route 114 and Route 35. Call 642-3743 for reservations or buy tickets online at www.schoolhousearts.org. 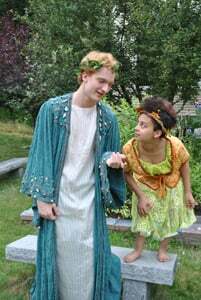 Cast from the upcoming Schoolhouse Arts Center production of “A Midsummer Night’s Dream” include Ben Plummer as Oberon and Angelica Phipps as Puck. 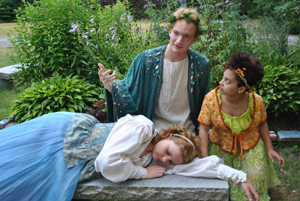 Cast from the upcoming Schoolhouse Arts Center production of “A Midsummer Night’s Dream” include Ben Plummer (standing) as Oberon and Angelica Phipps as Puck, with Kyah Morrissette (sleeping on bench) as Hermia.